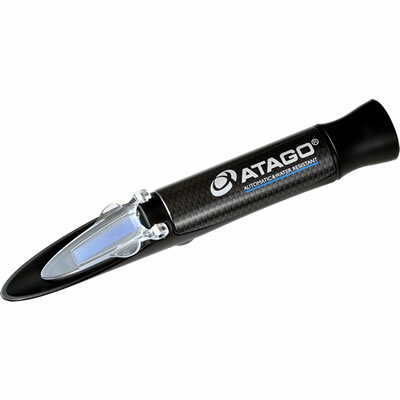 Atago 2491 MASTER-S/Mill-a (alpha) Handheld Seawater Salinity Refractometer. ATC: Automatic Temperature Compensation: 50-86°F (10-30°C). IP65: Dust-tight and protected against water jets (safe to clean up under the faucet). The MASTER-S/Mill-a (alpha) is used to measures the salinity and specific gravity of seawater, and utilizes a new material that is durable against salty samples, The salinity of seawater is displayed in parts per mill (‰). This refractometer has a scale for measuring the sea water salinity per-mill (ppt or parts per thousand) and water density of seawater. By simple operation the user can obtain a direct reading quickly of the salts concentration and specific gravity of seawater. Sample types include: seawater, artificial seawater, and salt waters. Includes: Protective storage case and owners manual.